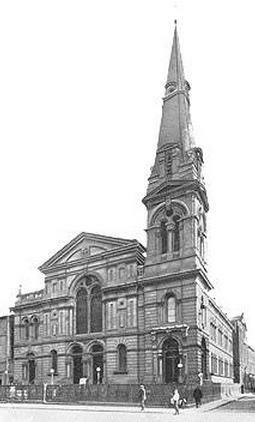 Picture taken from the book "Queen Street Congregational Church, Wolverhampton: the Story of a Hundred Years 1809-1909" by Henry Arthur May. 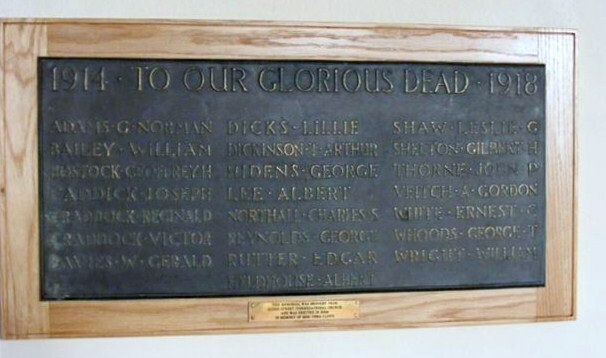 The memorial was erected in the vestibule at the main entrance to the church. The memorial is a panel of Carrara marble, surrounded by alabaster, on a background of dark panelling. The memorial covers a space 10' by 7'. The panel is called 'He is Risen' created by Mr. R.J.Emerson. The panel has two female figures, an angel and a mourner. Son of Harry Bailey of Calf HeathShareshill, Wolverhampton. Son of W. H. and Annie B. Bostock of "The Woodlands," Avenue Rd. Wolverhampton. Grave Reference: II. B. 21. Son of Elisha and Mary Ann Caddick of 645 Parkfield Rd. Wolverhampton. Son of Frederick William and Mary Ann Amy Craddock, of "Silverdale" 10 Oaklands Rd. Wolverhampton. Information taken from Express & Star,Thursday 17th January 1924.